The State University of New York (SUNY) College of Environmental Science & Forestry (ESF) Gateway Center transforms a barren parking lot into a striking symbol of environmental stewardship and climate action leadership. This three-story campus center totals 54, 000 gross square feet, providing a conference facility, café, bookstore, and admissions and outreach offices unified by a sweeping concourse that supports students, faculty, and public gatherings. Founded in 1911, SUNY-ESF is the nation’s oldest college dedicated solely to the study of the environment, currently serving approximately 2, 250 students (1, 650 undergraduates and 600 graduate students) and one of 64 campuses comprising the SUNY system. 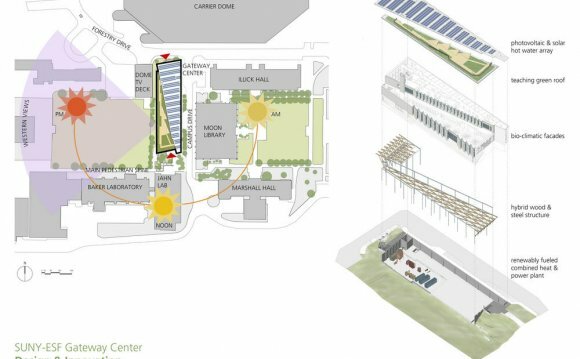 The 15-acre urban campus, located in Syracuse, New York, was previously heated entirely by fossil-fuel generated steam purchased from adjacent Syracuse University.